World Kindness Day, the day intends to to make the world a better place by encouraging people to be kind to each other , spread happiness and also promoting good deeds. WHEN IS WORLD KINDNESS DAY? World Kindness Day was first celebrated in 1998 by The World Kindness Movement, it’s an organization formed at 1997 Tokyo conference of like-minded kindness organizations from around the world. 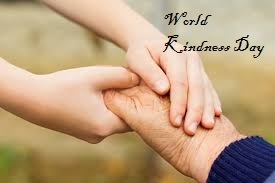 World Kindness Day aims to create a kinder world by inspiring individuals and nations towards greater kindness.